Julio joined the North Island team over five years ago as a bartender and through dedication, passion and enthusiasm, worked his way up to Head Bartender. 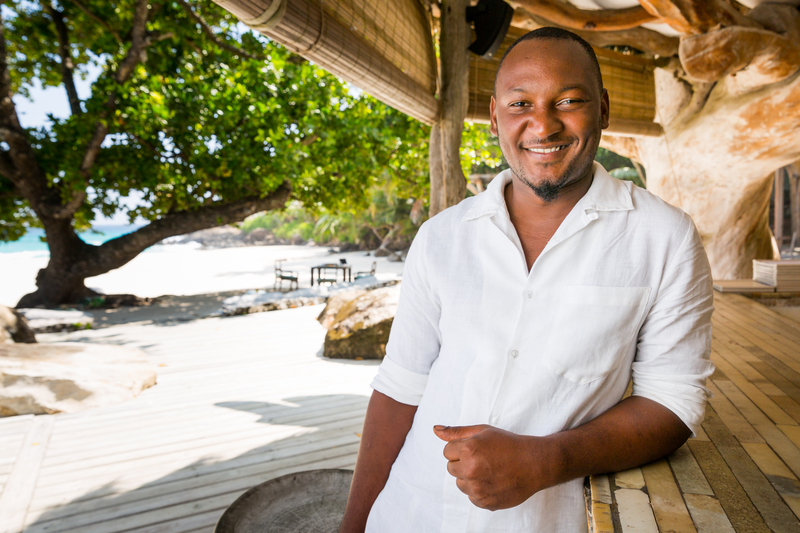 Prior to North Island, Julio studied at the Seychelles Hospitality and Tourism Training Centre for one year before honing his skills in restaurants on the mainland of Mahé as well as other private islands. Julio is passionate about mixology and loves to invent. Every day he concocts new recipes to suit each of the unique palates of our guests. While he enjoys making traditional cocktails, he loves to spoil and surprise our guests and make the most of the freedom of expression allowed on the Island – something that is unique to North. We do not have a set cocktail menu, but rather listen to our guests and create personalised drinks tailor-made to their preferences. Julio enjoys using fresh produce foraged from the Island, such as wild passionfruit and Seychellois bigarad, as well as fresh herbs plucked from the Island vegetable garden to add a unique twist to his cocktails. Get Julio’s Pina Colada recipe that uses ripe pineapple and fresh coconut milk (or even a scoop of our homemade coconut ice cream for extra indulgence) – try this at home and you can almost feel the sand between your toes at West Beach! Julio knows his wines well too and a highlight of his career has been his recent trip to South Africa with our F&B Supervisor for a course in wine training and pairing through Under the Influence. Mervin and Julio visited the Cape’s top vineyards where they were fortunate enough to spend time with some of the best winemakers learning about the unique people, processes and places behind the wines. One of the perks of the job according to Julio is, “working in one of the most beautiful places on Earth”. He also thrives off the positive work environment and the strong team that he is surrounded by. When he is not working, Julio’s favourite hobby is fishing and he fills his spare time writing his very own cocktail book.